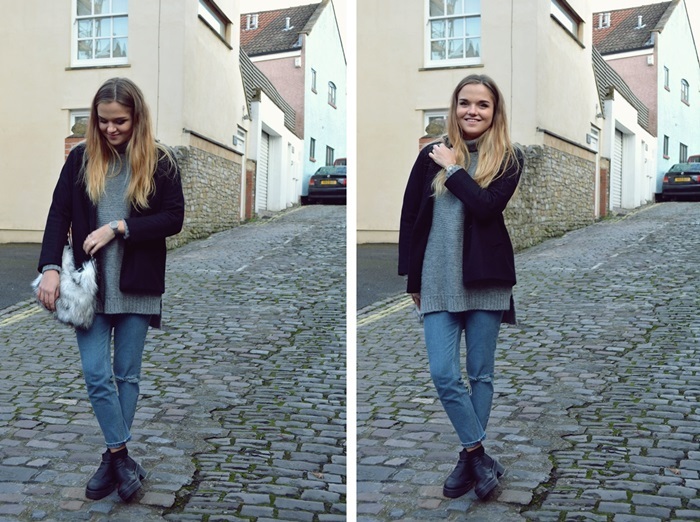 Say hello to an outfit composed of some of my favourite A/W buys so far. I can already tell that this Zara jumper is going to be an absolute staple, and at only £19.99 it's so much more affordable than similar pieces in places like Topshop or even H&M this season. Zara strikes again! I'm also obsessed with the fit of the 'Farleigh' jeans from ASOS, and am seriously considering getting them in black, too. They're the perfect medium between 'mom' and skinny, and aren't baggy around the waist like most 'mom'-style jeans are. I'm just annoyed that I didn't discover them sooner! Topped off with comfy black boots and faux fur and I was all set for a browse of some cute shops & cafes on Gloucester Road in Bristol with the girls. We failed to realise that most of them would be closed because it's Sunday...but had some pretty darn delicious iced coffees in the sun nonetheless. I'm seriously starting to fall in love with this city. I spend most Saturdays around Gloucester Road- I just love the vibe! It's a shame so much is closed on a Sunday, it's peak mooching day for most people! gorgeous outfit as always, that is such a lovely bag! Love your jumper it looks so cosy! Plus I keep hearing great things about these jeans, definitely my next purchase.